The town of Waterbury was established in 1763 under a grant from King George III, but sustained settlement did not begin until 1780. Many of these early pioneers were from Connecticut. 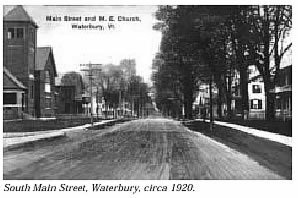 In fact, Waterbury, Vermont, took its name from Waterbury, Connecticut. Lying where the Winooski River breaks through the Green Mountain chain on its way west to Lake Champlain, the town sits at a strategic intersection: east-west, from Montpelier to Burlington, and north-south from the Mad River Valley to Stowe. Therefore, Waterbury was a logical location for an establishment catering to travelers going in either direction. The original structure was built in 1826 by Waterbury’s first lawyer, Dan Carpenter. However, a letter discovered behind the walls during a recent restoration indicates that the actual builder of the inn was a Mr. Allen, with Horace and Henry Atkins as carpenters and joiners. A Mr. Parmalee has also been named as the original owner. The building later became an inn and tavern, serving as a rest stop for travelers and also as a local meeting house. The King David Lodge of the local Masonic order met in the ell at the rear of the building. Because of the strong anti-Masonic movement at that time, the only available meeting places for these groups were the local taverns. The railroad across the state had not yet been built, so travel was by horse-drawn coach over rutted roads—icy and snow covered in winter, and a bottomless sea of mud in the spring. At that time, Main Street (now Route 2) was known as the Winooski Toll Road, a forerunner of revenue raising practices to come. In 1848 the railroad came through central Vermont, so stagecoach travel survived only in the north-south direction. As the 19th century progressed, resort and recreational travel began to supplement trade and commerce. Hotels were constructed in the mountains at Stowe as a healthy antidote to summers in the big cities. Guests would travel with entire families and their servants for weeks, or even for the entire summer. Arriving in Waterbury by train, they would often rest for at least one night before proceeding to their destination at the larger resort hotels. By 1898 an electric trolley put the stagecoach out of business, carrying passengers, baggage, and freight between towns. The trolley lasted until 1932 when the private automobile became the favored means of transportation. The original inn was a large, plain structure designed in the Federal style. Records indicate that for a time, the stable barn was painted “lead black.” In a photograph dating from the 1880s, the barn does appear to be painted this unusual color. One explanation has been offered that houses were painted black as a temporary gesture of mourning and respect following the assassination of President Lincoln. At any rate, by 1890 we see another photo captioned “Miss Annette Henry’s Home, one of the many summer homes for city visitors among the green hills of Vermont.” No vestige of black remains. The Henrys were prominent in town. The inn had come into their possession through purchase from the Carpenters. During their ownership, and throughout most of the 19th century, it continued to serve the combined functions of residence and hotel. Margaret Annette Henry was born in Waterbury in 1848, one of eight children. Her father, Sylvester Jr., was usually known as “Esquire” Henry, and the property was called “The Henry Farm.” Much of what we know about Annette comes from genealogical records of the family, and from surviving neighborhood children and persons who worked for the family. Annette is the central character in the history of the inn, and who gave to it the appearance it has today. Annette was better known as “Nette” or “Nettie.” She was high spirited, with high cheekbones, a large nose, and hair in a bun behind. She smoked cigarettes at a time when this was considered a capital sin, and, according to her chauffeur, from time to time she chewed tobacco—he claimed that he saw the stains at the corners of her mouth. To complete the picture of her eccentricity, in later years Nettie became “deaf as a post,” in the words of an employee. She used an ear horn and took to wearing a dark celluloid eyeshade much of the time. All in all, Nettie herself was a mixture of small town money and salty Vermont farm wife. Nettie married Albert H. Spencer, who made his fortune in rubber. He was the owner of several factories in Ohio and owned real state in Burlington. At one time, the Spencers' residences included their Waterbury house, a suite at the Waldorf Astoria in New York City, a house in Newport [Rhode Island? ], an apartment at 37 Avenue Victor Hugo in Paris, as well as one in London. With the influx of millions of dollars into the family coffers, Nettie and her husband set about transforming “The Farm” into an edifice befitting their new status in high society. The house retained the narrow profile of its original Federal style, but the third level was made to accommodate an upper floor apartment. The addition culminated in a Queen Anne gable above the roof line, which was pierced by a rectangular balustrade recess. The late 19th century ells, each with a porch, were appended to the building at this time. Other Queen Anne period alterations included narrow clapboard sheathing, shingle clad gables, and a decoratively coursed chimney on the south side. Inside, consistent with 19th century taste, improvements included wood paneling throughout, stained glass around many of the windows, acid etched glass on either side of the main entry doorway, and a framed tapestry in the front hall. What all the furnishings were like we can only surmise, but it's likely they reflected the new prevailing style of Victorian elegance. According to local witnesses, however, the interior's net effect was dark and rather gloomy. Despite their grand efforts to create this transformation, Annette and her husband apparently spent little time in Waterbury, and by the end of the century the house reverted to its status as a hotel. In 1907 Albert Spencer died in London, and from that time forward, the saga of “Mrs. Spencer,” as she had become known, is an indeterminate mixture of fact and rumor. It is said that she was not popular with the other Waterbury matrons, and it is not difficult to see why, given her sudden rise from The Farm at 18 North Main Street to international high society. Whether these rumors have any real foundation or were prompted by envy is hard to say. By Vermont standards of the 1930s, Mrs. Spencer was very well off indeed, with an annual income of about $30,000 and as the owner of several properties around town. She was a hard person to do business with, bargained down to the last penny. But she also had moments of generosity, sometimes with strings attached. Someone remembered a gift of $5.00, given on the condition that it be deposited in the bank immediately. Shortly after this, Mrs. Spencer was removed to a nursing facility in Massachusetts where she died in 1947. A mausoleum just inside the nearby cemetery next to the Congregational Church is her final resting place. Beginning about the time of the First World War and continuing into the 1920s there were substantial changes to “The Farm.” A street had been laid just to its north, running back about a quarter mile to the river where a bridge crossed over to Duxbury. This is now Winooski Street. From land records it appears that substantial tracts at the edge of the original Henry property were sold off as building lots for homes, so that The Farm was now no larger than a village residence with a tree-shaded grassy lawn at the side, widening into a green expanse at the rear. 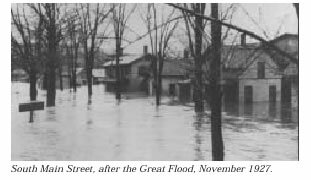 In November 1927, there occurred a disaster of almost biblical proportions which to this date reverberates in Vermont history—the Great Flood. Three days of torrential rains poured more water into the Winooski watershed than the river could handle. It rose to unprecedented levels, carrying all before it—houses, barns, bridges, cattle and other livestock, roads and railroad tracks. Fifty-four people in the Winooski Valley lost their lives. The situation in Waterbury was alleviated somewhat by the wide flood plain between the river and part of the village. Even so, houses in the low-lying parts of town were float ed off their granite foundations and left bobbing at crazy angles in the muddy current. A long row of elm trees along Winooski street caught debris that swept downstream, creating a barricade against which more debris piled up, raising the water level. Only the highest ground at the intersection of Main and Stowe streets remained above water. At the Spencer house flood waters reached well up toward the second story. But the house survived better than the surrounding region, which took many months to fully recover. In 1928 new bridges were built, and a series of three flood control dams were constructed on the Winooski and its tributaries as prevention against a future recurrence. and restraining systems, save their cost every year, more comfort more profit.” With typical Vermont Yankee frugality, however, he and Mrs. Norton supplemented this income by continuing the tradition of renting rooms to outsiders. Some of these rooms were converted into self-contained efficiencies with stoves, sinks, and running water. After Mr. Norton’s death in 1972, the building became less a residence and more a rooming house, with a deteriorating quality of clientele. 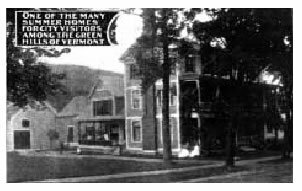 For many years Vermont’s mental health facilities had been located in a large campus-like tract at the southern end of town. In fact, the name "Waterbury" had come to signify the insane asylum to most Vermonters Not all of its patients required full-time institutional care, and many were housed in local dwellings. Several were usually in residence at 18 North Main Street, along with various relatives and other persons needing inexpensive shelter. With the Mrs. Norton's limited income, maintenance on the house ceased. Bits of furniture were on often displayed for sale on the front porch. Finally, Mrs. Norton was forced to sell off the expanse of lawn at the rear. The property was now reduced to the building itself and little more—a sad but common fate for grand old houses fallen on hard times. By the early 1980s the building was in a state of gross disrepair. At time of Mrs. Norton’s death, there was a real question about what to do with it. To many Waterbury residents it represented the village’s golden age, so a proposal to locate a discotheque there met with quick disapproval. The town fathers agreed that no wrecking ball would ever strike the building. Nevertheless, few prospective buyers were able to come up with the large sum required to bring the property back to its former state. At this point good fortune intervened in the arrival of a couple from the Boston area, Kimberlee and James Marcotte, both young and full of energy and enthusiasm. Kim was a native of Waterbury, and her family still lives in town. In the decayed but still elegant old structure, they saw a unique Vermont treasure with potential to become a country inn. They hoped to recreate the atmosphere and appearance of a bygone era, furnishing it with period antiques, pictures, and crafted knicknacks scattered through the many rooms. They were well qualified for such an undertaking. Kim was a talented decorator with a real feel for the old Vermont. Jim was a building contractor specializing in the restoration of old houses. 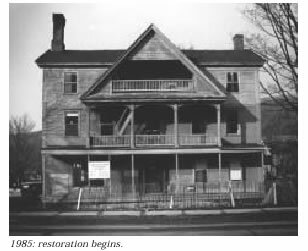 In 1985 the Marcottes bought the property and set about bringing it back to life with the help of the Historical Society and a substantial loan from the Small Business Administration. Waterbury natives looked on with interest and astonishment as windows were torn out, walls came down, and rooms were gutted. A first floor bedroom was transformed into a library and bar. On the third floor, ceilings were ripped out to expose the original handhewn beams. 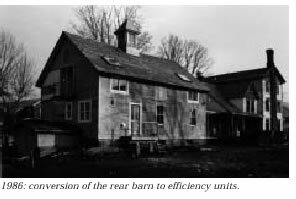 In back, the ells and stable barn became five efficiency suites, completely equipped for longer term stays. A sprinkler system was installed, as well as a commercial kitchen. Outside, the lawn at the side of the building became a parking lot for guests. Not many of the original furnishings remained. To preserve the sense of “real” versus “simulated” antiquity, Kim and Jim bought the entire contents of two old houses from two elderly sisters in Massachusetts. This collection was transported to Waterbury. The better pieces were placed throughout the inn. What was left disappeared in a gigantic yard sale held in the parking lot. For finishing touches, Kim decorated the public rooms in colors beloved by Victorians, but out of fashion today: pink, lavender, and burgundy. The exterior was painted mauve with white trim. The whole reconstruction process took about two years, and the inn opened for business in 1987, offering to prospective visitors both lodging and the creations of a gourmet kitchen. Because of careful attention to authenticity both in construction and decor, the inn was listed in the National Register of Historic Places. One wishes that so much talent, effort, and imagination could have had a happier ending, but that was not to be. For one thing, timing was not propitious for a new enterprise. Starting in the late 80s the nation was mired in a severe recession that adversely impacted summer travel and tourism as well as ski vacations in winter. Also, it was questionable whether a gourmet restaurant in Waterbury, with high-salaried chefs, could survive the slow periods in early spring and late fall. Finally, there remained the demands of the couple’s basic business in Massachusetts, which necessitated a division of their time between Vermont and Boston. For all these reasons and perhaps others, after its initial strong start, the inn began to lose ground. Effects of the recession showed no sign of abatement during 1990–91, and business continued to decline. Finally, in 1992 the decision was made to give it up and close the doors. From April 1992 to August 1993 the inn stood empty. Many interested parties considered buying, but nothing came to fruition. Just at that time, however, a father and son team from Westport, Connecticut appeared on the scene. John Barwick and John Barwick Junior had made the decision to abandon the high pressure business environment of the New York Metropolitan area. The break was irrevocable, houses were sold, and the family business closed down. There was only one small problem. Neither of the two had the least experience with innkeeping. The Small Business Administration (SBA) was not at all convinced that this asset should be entrusted to two willing but untried amateurs, especially two individuals whose experience was not in the hospitality field, but in advanced interactive technology systems. It was much more than simply writing a check. The SBA had to be convinced that this team could make the inn succeed. In the end, after much discussion, the sale was closed on September 2, 1993. On September 25th, under new management, the inn welcomed its first guests. Between September 2nd and 25th, all state and local operating permits and licenses had to be secured, basements cleaned out, and a concrete floor poured to facilitate storage. In addition, suppliers needed be identified, orders placed, windows washed, all rooms cleaned—several repainted—and the contents of two houses moved up from Connecticut. Fortunately, since the Barwicks had fifty years of antique collecting between them, their possessions augmented rather than detracted from the old fashioned atmosphere of the inn. By opening day, although the inn looked good, both innkeepers were in a state of physical exhaustion. Nevertheless, the “Vacancy” sign went up and a horde of foliage peepers cascaded through the front door. Neither partner had been fully aware of the implications of “foliage season” and the crowds of visitors that always come with it. But somehow they made it through the following month, running on adrenaline and a determination to give guests the best service they could. Since that time, the inn has prospered, operating primarily as a bed & breakfast. In addition, there are occasional private luncheons, dinners, weddings, and parties. The owners were successful in buying the original expanse of lawn at the rear of the property. This green vista onto the hills behind town is now protected against the intrusion of unsightly development. Around it, the town has been enjoying a renaissance. Many of the fine homes along Main Street have been rehabilitated. More and more travelers have come to appreciate the convenience of Waterbury’s central location as they explore in all directions the sights and experiences that this area of Vermont has to offer. Often part of an old home's character is the story of former residents, now deceased, who linger on through the years to keep watch over their former domain. It's not that they don’t trust the newer generation, it's just that the home was such an important part of their lives, they can’t seem to let go. In fact, many locals are of the opinion that an old house is not really the genuine article unless a ghost is in residence there. For those who are interested, rumor has it our inn has one of those ghosts. To find out more, click here to read about our resident ghost.